I love packet tricks. And especially when they use pictures or have unusual artwork, they can offer a very entertaining change-up from regular card magic. So if you're looking to move away from a cliched "pick a card" trick, then packet tricks usually provide something clever and different. And that's exactly what we have here, in this package of packet tricks from Paul Hallas, entitled The Ultimate Card Trick Collection. 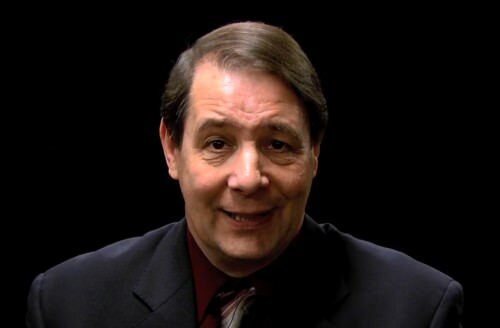 For those who don't know him, Paul is a respected authority on packet tricks, having authored books dedicated exclusively to this form of card magic, such as his well-regarded titles like "Small But Deadly" (2005) and its sequel and larger companion, "Still Small, Still Deadly" (2010). You can see him perform many packet tricks over on his youtube channel here. 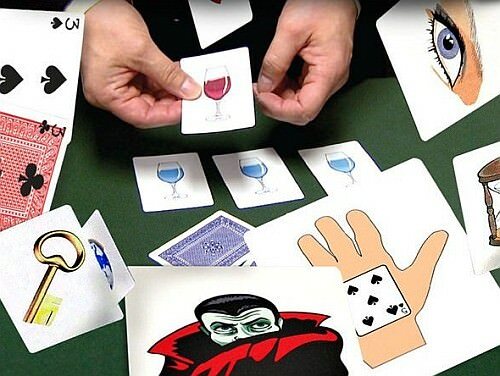 In The Ultimate Card Trick Collection, we have no less than seven different sets of packet tricks from Paul: Fortune Deck, Cloned, Vampire Dawn, Not Another 3 Card Trick, Handy Tricks, Water to Wine, and Something From Nothing. At one time these tricks were sold separately or packaged in pairs along with a DVD, but now you get the whole lot together with instructional materials online instead. The video shows Paul Hallas demonstrating each effect, and then immediately explaining how to perform it, sometimes along with a couple of variations. The entire video is an hour and 48 minutes long in total, so it's a large amount of high quality footage altogether. 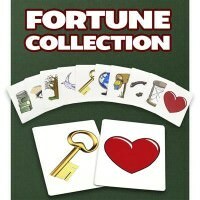 This is the longest video of the lot, with a series of routines based on a set of 10 cards featuring fortune-style pictures on them: a world globe, an hour-glass, a horse-shoe, a dove, a tree, a heart, an eye, a mailbox, a key, and a wad of cash. Effect: You secretly place an item into a spectator's hand, without that person even knowing what it is. Then you show a series of cards with fortune style pictures on them, shuffle them, and deal them onto the hand of a second spectator until they say stop. The card they stop at turns out to have money pictured on it - which corresponds exactly to what is in the first spectator's hand! Comment: Paul refers to this routine as "coincidence". It is more a mentalism rather than magic routine, and is based on something Paul calls the Fortune Force. As he points out, if you know a good trick you know one trick, but if you know a good force you know lots of tricks. Paul also explains how to set this up on the fly, making it good for walk-around. He also covers variations in which you use different objects like a key or lucky charm. Variation: Paul also provides another idea that uses a map along with some blank cards that makes use of the same Fortune force to produce an exact match for a place marked on the map. This really belongs on a later part of the video entitled "Fortune Forces" and felt out of place at this point, especially since it uses entirely different cards. Effect: In a first variation, a spectator cuts the deck at a random card from a shuffled deck of fortune cards, and you can then identify the card despite never seeing it. In a second variation, which uses a completely different method, a spectator picks a random face-down card and returns it anywhere into the pack and you can read their mind and identify it. Comment: These variations will appeal to you if you enjoy mind-reading style tricks, although the method used for both of them is fairly basic, making use of a key-card principle and one-way back design of the cards. 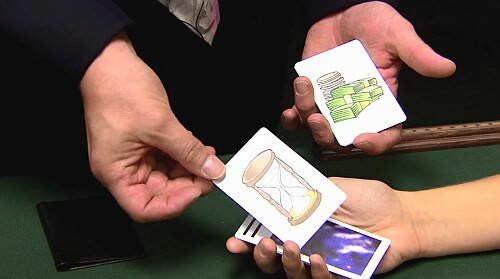 They aren't very impressive magically, but with good presentation could make an impact as part of a mentalism effect. Variation: Another variation is provided after the explanation of the two mind-reading effects. It offers a fun magical moment, where the Heart card appears magically reversed in the deck while being held between the hands of a couple - ideally a romantic couple. Comment: Even though it only takes up about 3 minutes, the trick with the Heart card really deserved to have been given a separate name and a separate presentation/explanation, since it isn't at all connected with the others. It's a simple effect that is more magical (relying on the Brae reversal) than mentalist, but I found it a cute routine that I'd like to try some time. Effect: Another variation of the Fortune force uses blank cards to stop at a random monster, a stuffed version of which is then produced from a bag. This can be being repeated immediately by producing "The Invisible Man". Comment: This is just another variation that alters the presentation. Helpful in this section is the explanation Paul gives about how to handle cases where the spectator doesn't say stop at all, but lets you go through the entire deck. Effect: A card depicting a cartoon man is shown and placed face-down on the table. A series of cards are shown with cartoon men, each having a "voodoo pin" on a different part of his body. The cards are shuffled, and when the spectator says stop on a random card, the face-down card has changed - the very part of the body corresponding to the card they stopped at has been removed from the body! Comment: Paul credits this as a variation of a voodoo routine from Al Sparkman (?) that appeared in Genii magazine in the 1950s. The home-made cards (you need blank faced cards for this) make this seem a little amateurish. But it is one of the more fun uses of the Fortune force, especially given the surprising and apparent change to the face-down card. Another nice thing about this is that all the cards are examinable. In the explanation Paul also teaches the Elmsley Count for those unfamiliar with it. Overview: Four of the above effects actually use the Fortune cards; the others use the Fortune force with blank faced cards. For the final part of the video Paul gives some suggestions for how you can use the Fortune cards to do an actual "reading" as a fortune teller, by having someone select three of the cards randomly, and he suggests possible interpretations for each card. Comment: I appreciate that Paul offers positive meanings for all the cards, but by his own admission, the idea is to suggest things that make people feel good and are nearly always true anyway. I didn't find this part of the video helpful at all, because I think most magicians will tend to shy away from any serious kind of fortune telling, knowing that it is bogus. 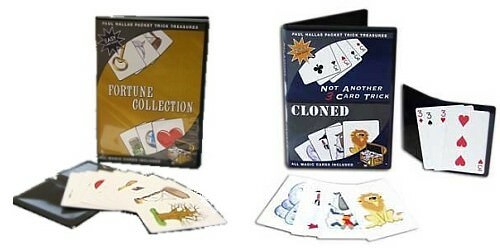 Effect: From an envelope marked "Danger: Genetic Material Enclosed", you remove a number of cards, one labelled "Reject" that you lay aside, four animal cards (a sheep, lion, penguin, and snake), and four blank cards (blank "cloning plates"). One at a time the four animal cards (in the order decided by the spectator) are cloned, and then fade away. 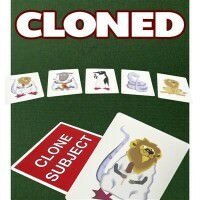 But it turns out that cloning isn't so safe after-all, because the four animal cards that were used for the cloning are now shown to have turned blank, while the "Reject" card is shown to be the result of a previous cloning experiment that didn't quite work: a mixture of all four animals! Comment: This is a variation of a Peter Duffie effect entitled "Clone Zone" that can be done with a full deck of standard cards, and which Paul Hallas bought the rights to so he could use the basic mechanics but develop it into a fun variation as a packet trick with picture cards. This isn't the strongest trick in this collection; because you're cloning four cards and repeating exactly the same moves for each, it becomes quite lengthy and interest starts to get lost. 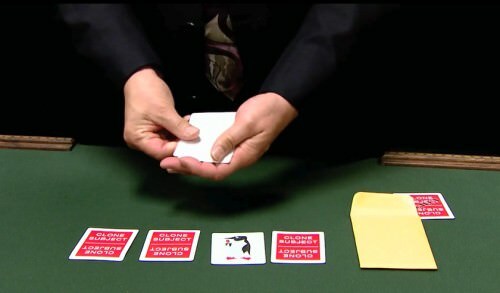 The spectator will naturally suspect that the cards in the packet are the animal cards, especially since they are "returned" face-down to the table; if there is any such suspicion, it only gets stronger when they are later shown to have turned blank, and rather than strengthen the magic, this revelation actually starts to reveal the method. One redeeming factor is the story itself, and the cloning plot used is an amusing one that you can have fun with, so if that appeals to you, you might still want to consider giving this a go. It's also a good opportunity to learn moves like the Flustration Count, Elmsley Count, and Vernon's through-the-fist flourish. Effect: A blank card is placed face-down on the table, and you tell the story of the dying art of vampires, showing cards with pictures of four vampires, who are on their way back into hiding before dawn. But unfortunately someone prevents them from making it before dawn, and the cards turn into dust; now all four cards are shown to have turned blank. As a final twist, the blank card on the table is turned over to reveal that it's no longer blank, but now has the name of the Vampire Hunter responsible for this mystery: Prof. Van Helsing. Comment: Besides the gaffed cards that are essential to this routine, knowledge of the Elmsley Count is required to perform this effect, and Paul does a good job of teaching it. The Vampire story helps carry the narrative, but this theme won't work for everyone, so it is one limitation of this routine. Effect: After introducing the idea of the world famous 3 card trick normally known as 3 card monte, you introduce four blank cards. 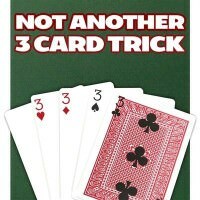 Why call it a three card trick if they are obviously more than three cards? Because one at a time, the three cards are turned into 3s! There's an amusing twist at the end because the final card is printed on the back - because you used the wrong sleeve to make it change! Comment: Paul introduces by saying that this is probably his favourite packet trick; it's very commercial, and ideal as an opener for table-hoppers and walk-around, because it is quick and entertaining, and because it is instantly re-set when you are finished. It's certainly very easy to learn, and if you already know the Flustration Count, then there's just one other fairly basic move Paul teaches, and the gaff cards will do the rest of the hard work. Ten gaff cards are supplied and used for two different effects; the first effect only uses 6 of these but you have to supply a regular deck to go with them; while the second effect only uses 8 of these. Double Revelation: A card is freely selected by a spectator and turned face up. The two adjacent cards are removed from the deck. Then some cards with hands pictured on them are introduced, and finally the two cards previously removed from the deck are revealed and shown to be exactly the same two cards pictured on the "hand" cards! Comment: In terms of method, this reminds me of a relatively simple trick called "card Between the Jokers" that I've been performing for years, although here the use of the "hand" cards adds some elements to make it seem more magical due to a simultaneous match - while adding some extra handling and things to remember in the process. The sleights used are very simple, and yet in my experience the main move required (Prophecy Move or Bill Simon Turnover) never gets noticed! The explanation also covers the Hammond Optical Count (Flustration Count), and an alternative way of doing the trick for a single spectator with a single card using the Elmsley Count. Variation: Two piles of four cards each are introduced - one pile is shown to have all blank cards, the other has four hand cards. Then one at a time, invisibly the hand cards travel to the other pile; after each move, one hand card is shown to have gone and moved to the other pile; at the end, all four cards in each pile are shown, and indeed there has been a complete switch! Comment: Paul explains how this can be performed as a routine immediately following the first effect. The transposition is both convincing and powerful. Several fairly easy sleights are used and taught, including Visa Count, Flustration Count, Elmsley Count, and Jordan Count. The use of double blank cards really helps make it a clean routine, although there is a fair bit to remember. Effect: This is a variation on the classic Wild Card effect, and in his explanation Paul briefly runs through some of the background and credits. 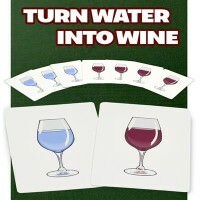 A set of seven cards are shown all to have water, except one which has wine. Then one at a time, they turn into wine. Comment: In his patter I'm glad Paul didn't make any reference to Jesus turning water into wine, which would be trivializing an actual miracle; although this implied connection still makes me slightly uncomfortable with this theme. Although as he rightly points out, it is a fun gag that makes it well suited for doing at a restaurant or bar. Paul himself has a series of drinking jokes that he tells as he does the routine, which I think actually distracts from the effect itself - although he has so many gags that you can just pick some of his material if you like. But of course this is a trick that you customize to your own style, and the real appeal is the gaffed cards, and the effect itself. This version of Wild Card uses 7 instead of 9 cards to save on table space - which can be an issue in restaurant settings. Along the way he does teach the glide and the double lift; and if these are sleights you already know, then you should find this routine very easy, especially since the changing of most of the cards happens with exactly the same series of moves. Effect: Can magicians make something from nothing? This packet trick starts by showing four cards which appear to be completely blank on both sides. 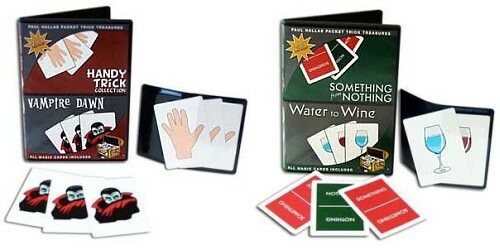 One at a time, all four cards magically turn into a red card that says "Something". 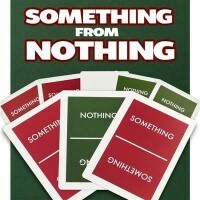 Then as a final twist, the cards are turned over to show that all four of them have turned into green cards that say "Nothing." Comment: This trick is a very playful one, and revolves around the clever bit of wordplay with the words "Something" and "Nothing" . The moves in this effect are based on Vampire Dawn, but there is more going on and more to learn (due to the need to apparently show both sides of the card), even though it can be performed more quickly. Paul also teaches both the Elmsley Count and Jordan Count which are also needed. This trick will definitely require some practice to master. If you prefer a story-oriented trick, then Vampire Dawn is a better choice; but many people might prefer the cleverness and cuteness of Something From Nothing, especially if the vampire theme doesn't appeal to you. The cards are poker-sized, and have an air cushion style finish, and seem to be durable and handle well. Some of them have red or blue backs, with a simple non-descript pattern. So they aren't the familiar rider-backed cards from Bicycle, but they look fairly ordinary and innocuous and they won't draw attention to themselves, making them very practical for their use in tricks like these. They are embossed and appear to be decent quality, so they should handle normally and not make sleights any harder than they have to be. The video production quality is outstanding. Judging by the date on the product, this was actually filmed and produced in 2008, about 10 years ago. But the production quality is terrific, with very clear audio and great videos, with multiple camera angles and filming. Thumbs up all round as far as that goes - you couldn't ask for more. Streaming online also worked well, and this is a great way to access instructional material in a way that is convenient. Paul's teaching is solid. He does cover sleights like the glide, double lift, and various counts like the elmsley count, Jordan count, flustration count, and visa count, which a number of these tricks require. Most intermediate magicians will already know these moves, which means that all of these tricks will easily be within your ability. But if you aren't familiar with those sleights, you'll learn them from Paul, although learning fundamental sleights like these well makes it advisable to consult other resources in order to master them properly. Most explanations run for 10-15 minutes, and at that point you won't have any questions about how everything is done, because Paul capably covers everything well in that time. Tricks like these aren't for complete beginners, because they do require technical skills with fundamental sleights like the glide, double lift, and elmsley count. While Paul does teach these sleights in the explanation videos, I wouldn't recommend this as the ideal place for a beginner to learn intermediate level magic; it's better to first develop some basic competency with handling cards and performing easier magic. That said, for the intermediate magician, these tricks are all very straight forward and should be easily learned - the main thing to master will be remembering the series of moves required. Practice is always essential for all magic, but there are no knuckle-busting moves here or complex routines; these are really ideal tricks that a working magician who performs walk-around magic or does table hopping in restaurants can easily and quickly learn, and it won't require too much effort to be using these in their working repertoire. I'm still a big fan of packet tricks that employ normal playing cards, and the Packet Effects DVD with teaching by Simon Lovell remains my personal favourite. But what I appreciate about this collection from Paul Hallas is the novelty element of these cards, which you can use for some real fun and light-hearted magic. There's lot of potential for some fun patter with these as well. Paul does a good job in explaining everything well, and the video footage is excellent. If you're new to packet tricks and need to learn common sleights like the Elmsley Count, Paul has that covered as well. This may not be killer material, but with the right presentation, it can be used to create some strong reactions, and some real fun. 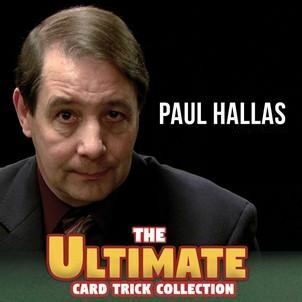 Fans of packet tricks or fun card magic will certainly want to take a look at The Ultimate Card Trick Collection from Paul Hallas, due to the novelty value of the effects it includes. Considering that it comes with seven different sets of gaff cards, there's a good amount of variety in the package, so it's also good value. What's the price for it? I can't find it on your website. The link I gave was just to the publisher's website. I normally buy my magic from Amazon, eBay, or Penguin Magic. You'll find it on eBay right now for around the same price. Paul Hallas is active on The Magicians Forum (profile link), so I'm sure he can also answer any more specific questions about this collection as well. Re: " Paul credits this as a variation of a voodoo routine from Al Sparkman (?) "
Probably my pronunciation on the video, that should be Al Spackman, His routine originally appeared in "The Gen" magazine and was later included in the book "The Art of Close Up Magic Vol.1" by Lewis Ganson. More recently (couple of years ago) Liam Montier sold a version of Al's routine with photographs on cards, which looked quite nice. As mentioned, my version is examinable at the conclusion. The 'original' Fortune routine, where the spectator is holding an unknown object I often used to use as a restaurant opener for couples. That particular routine and the force are fully described in my book "Small But Deadly". You could probably use cards pulled from any fortune telling deck for it. When it was going to be marketed I decided to add the one way back design to the cards. 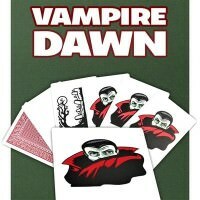 "Vampire Dawn" is also described in "Small But Deadly" the transposition part of "The Handy Trick Collection" and "Not Another Three Card Trick" are also there in the "Cartoon Packet Effects" chapter. This repackaging is probably just a way of moving old stock that's been sat there in the warehouse a while, but nonetheless it's a good price. They were originally marketed in pairs with the exception of "Fortune". Regarding " This is a variation of a Peter Duffie effect entitled "Clone Zone" that can be done with a full deck of standard cards, and which Paul Hallas bought the rights to so he could use the basic mechanics but develop it into a fun variation as a packet trick with picture cards." Peter Duffie's original "Clone Zone" can also found in "Small But Deadly" to conclude the chapter on him. 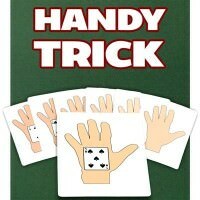 It was never done with a deck of regular cards but a packet trick with playing cards. My full deck version "Killer Clone Zone" came later and can be found in my book "Magic From The Overground" and on my "Clever Card Magic" DVD. If it had been up to me, I certainly wouldn't have called this new packaging "The Ultimate Card Trick Collection" which to me possibly suggests routines with ordinary playing cards and this is anything but. By the way, if anyone is interested in a specific routine rather than buying the package or just the cards for one of these routines because you already have the instructions in "Small But Deadly" you can message me privately. Thanks for the great reply and helpful information, Paul! Good point about the name too - you're right that the publisher could have come up with something more suitable and better than "Ultimate Card Trick Collection".